Sometimes I just laugh at myself for being so clever! 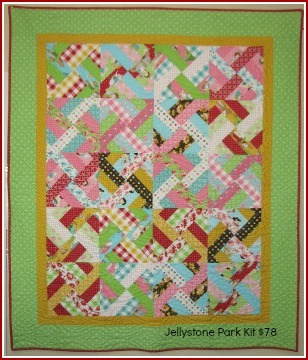 This Jellystone Park Quilt Kit features the Glamping fabric line by Moda. I just couldn't help it, the pattern is called Jellystone Park by Legacy Patterns, then I stumble upon the Glamping fabric by Moda, and pow, it's a kit! The size I chose takes one jelly roll and a couple of border fabrics. In the kit I have included the pattern, the jelly roll, both borders and binding fabric for a total of $78. There is just one block, but the way the blocks are organized together has a method. Try not to be like the calamity quilter and think you know what you're doing, only to find out I did a row backwards, therefore requiring the use of my seam ripper. You may be wondering what I think is so funny about picking this fabric and pattern together? Well, my shop, Quilt Lodge is just North of Yellowstone Park. We get tons of tourist people (many are quilters) who drive over the Beartooth Pass on their way to Yellowstone Park. The next thing you should know is I have a hankerin' to fix up a vintage trailer (I need one with a bathroom) and join up with the Sisters On The Fly group. So having vintage trailers, women with red lipstick and gingham checks all in the same quilt is just right for me. 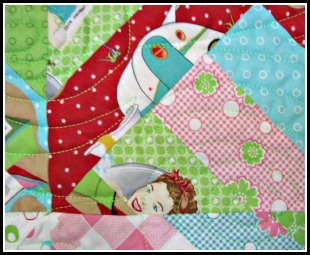 The Sister's On The Fly group has quite a few "sisters" who are quilters. So much to do in this one lifetime, hope I can get it all done! If you follow this link, you can find this kit, and others on my online Quilt Lodge shop.